Live stream today of a wonderful 16 min. sonata by a largely unknown work/composer...Beryl Rubinstein, (except to Cleveland flutists) who was Director of the Cleveland Institute of Music for 20 years AND the pianist for Eugene Ysaye. This was premiered by Rubinstein and the great Mo Sharp, should be a staple of the repertoire, but is not yet published... enjoy! Livestream begins around 2:50-3:15pm EST today from the Maltz Performing Arts Center in Cleveland. Two concerti on two different instruments with Greater Columbus Community Orchestra, Olev Viro, conductor. Ester Magi is an internationally recognized Estonian woman composer who is celebrating her 95th birthday in January. Lowell Liebermann is a living American composer who has written a beautiful showpiece for the many colors and characters of the oft neglected piccolo. Soaring, sweet, melancholy lyricism, poignant pianissimos coupled with the majestic, heroic, and high flying circus act. Looking so forward to collaborating with the fabulous jazz guitarist Don Better in an evening of Music from the America's at the trendy Gigi's restaurant on Fairmount. Will feature works by Lacerda, Machado, Pixinguinha, Jobim, the Great American Songbook and French Cafe Music from the 20's. Hope to see you there! Terrific collaboration w/ Molly Barth, founding member of eighth blackbird... recital and masterclass in conjunction with the Greater Cleveland Flute Society. Two Piccolo work by Frederic Rzewski, Tootle-oo which incorporates improvisation and slide whistle. Panorámicos will celebrating great Cleveland composers past, present and future in honor of the 50th Anniversary of the Bascom Little Fund, a philanthropic trust which supports and promotes work of Northeast Ohio composers and performances. www.bascomlittle.org. Partners include the Cleveland Public Library, The Western Reserve Historical Society, and WCLV, 104.9 FM. Free and open to the public with a reception following the concert. Works by Bascom Little, Klaus George Roy, Margaret Brouwer, H. Leslie Adams, Ernest Bloch, J. S. Zamecnik, Jim Hall and Tad Dammeron. I'm thrilled to be performing this beautiful work by Lowell Liebermann, a serious American talent. The first two movements are lyrical and melancholy, with a hint of playful. Then the third movement is serious fun, alla Shostakovich Circus Music! On the campus of Plymouth State University, Silver Hall, Hanaway Theater with the fabulous New Hampshire Festival Orchestra, conducted by Paul Polivnick. Free concert in Twinsburg Park. Concert Sunday June 12, 2016 at 3pm, University of Buffalo, Slee Hall. 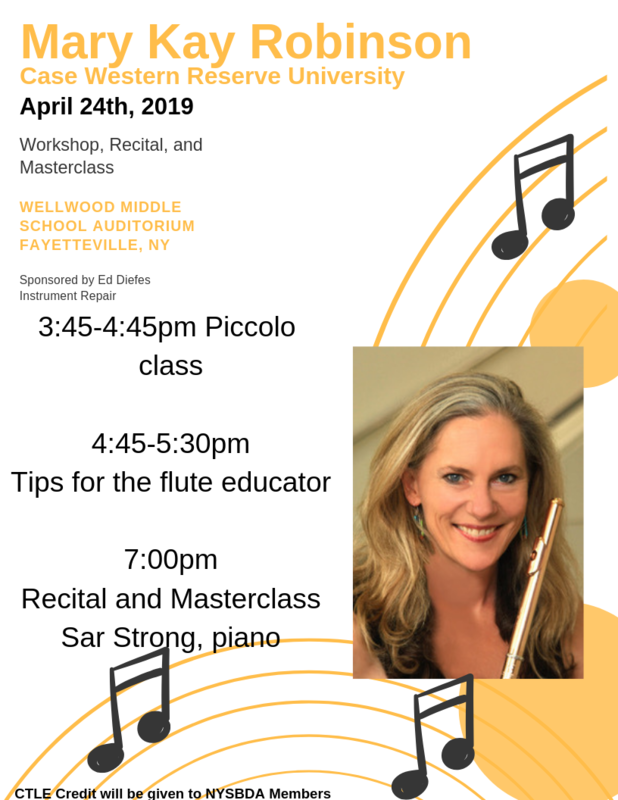 Guest Artist at the University of New Hampshire Flute Studio for Piccolo Masterclass. Free and open to the public. A classy way to usher in the New Year at Severance Hall! Free coffee and dessert for the whole audience, dancing to live music til 2am. A program featuring music, literature and personal stories from the Concentration Camps, in conjunction with Violins of Hope. Lynne Ramsey will be performing on a viola that was restored after being in the camps. “I Remember” is work for soprano, flutes, cello and harp by the wonderful NY composer Michael Cohen based on the Diary of Anne Frank, libretto by Enid Futterman. Orchestra and Chamber Concerts in Plymouth NH. Martinu Trio for Flute, Cello and Piano with David Goldblatt and Fraces Renzi. Performing and Recording Ken Benshoof’s “In Shadow, Light” for Piccolo, Violin, Viola, Cello.